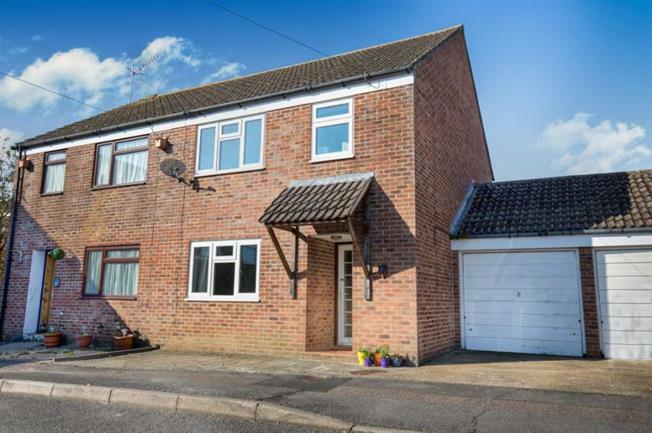 3 Bedroom Semi Detached House For Sale in Tonbridge for £285,000. Guide price 285,000 - 300,000. Freeman Forman are delighted to present this modern three bedroom semi detached house which occupies a pleasant position at the head of a small close in south Tonbridge within reach of the mainline railway station. The property offers well proportioned accommodation which includes entrance hall, sitting room, open plan dining room with kitchen and cloakroom. Stairs rise from the entrance hall to the first floor landing where three bedrooms can be found along with a bathroom which is fitted with a white suite. Outside to the front of the property is access to the single garage. The rear garden comprises of a patio area with raised area of lawn and decking area which would be ideal for entertaining family and friends. There is also access from the rear garden to the single garage. The property benefits from double glazing and a gas central heating system.